When people look at our daughter, Aleksandra, what do they see? Someone who can’t talk, someone who drools, someone who does not believe in personal space and is literally in your face? Some see the sign of sin. We have been interrogated about our conduct: drugs, promiscuity… there must be a cause. Some search further back for familial guilt: For whose past actions is she atoning? Some see only a social burden, a cost, a nightmare for teachers. How many just see Aleksandra? How many just see a human being to be embraced, respected, loved? How difficult is it to see Christ in her? How difficult is it to be Christ with her? (41). Myroslaw Tataryn and Maria Truchan-Tataryn are Ukranian Catholic Christians. He holds a doctorate in theology, and she holds a doctorate in literature with a specialty in disability studies. They are also the parents of three children, two of whom are disabled. Their oldest daughter lives with various physical disabilities, and their youngest lives with Rett Syndrome.Their experience of disability, then, is deeply personal. As it is for many Christians, however, it is also deeply theological. “We searched our faith tradition for signs of disability and, indeed, we found the Divine Trinity” (7). The book that emerged from this searching is Discovering Trinity in Disability: A Theology for Embracing Difference (Orbis, 2013). In this text, the authors explore the implications of the classical Christian doctrine of God for the ways in which we should understand, embrace, and live in ministry with people with disabilities. The first five chapters assume and rely heavily on standard concepts from disability studies, particularly the social and cultural models of disabilities. According to the social model, there is a distinction between disability and impairment. An impairment is some non-normative physical, mental, or emotional trait that a person may possess. A disability, however, is the discrimination that a person may experience due to the impairment. Stairs, for example, may disable people who live with physical impairments that cause them to use wheelchairs. The cultural model looks at the ways in which a society uses non-normative bodies and minds as a way of constructing itself philosophically and religiously. For example, Leviticus 21:16-23 makes us of certain physical impairments as a way of delineating which priests may or may not offer sacrifice. Discussion of the Trinity in earnest begins in chapter 6, “Discovering Trinity: Forming Christian Orthodoxy.” Perhaps the most important affirmation of the book is in this chapter: “As we delve into our corporeal nature to encounter its complexity, diversity, and vicissitudes, we experience God in us and with us. We are who we are because of who God is” (59, my italics). The Christian understanding of humanity must derive from the Christian doctrine of God, since we believe we are created in the image of God. While many Christians have understood the imago Dei individualistically, a serious reckoning with the doctrine of the Trinity leads us to a more communal understanding. Augustine’s influence on Western Trinitarian thought is second to none; for many, “Augustine is often treated as the source and exemplar of a distinctively western style of trinitarian theology” (Ayres, 51). For these readers, Augustine’s approach is exemplified by a focus on the divine unity that is reflected by analogy in the internal operations of the human mind. For this reason, unity–singularity, not Trinitarian diversity, becomes the dominant paradigm for the Church and human community. Similarly, the purported Augustinian emphasis on interiority privileges human rationality and the imagined perfections of Platonic forms, and identifies the image of God with human reason…. Consequently, the theological tradition of the Christian West has related knowledge of God with the unity of God’s essence, thereby subordinating the relationship of Divine Persons. Trinity becomes a secondary concept (67). They argue, however, that this is a misreading of Augustine: “In the past few decades, a number of scholars have demonstrated that Augustine’s Trinitarian theology is much closer to that of the Cappadocians than has been presumed, and that the relationality of the three persons of the Trinity is indeed central to his work” (68). Properly understood, Augustine, as much as any other classical Trinitarian thinker, will lead us to understand both God and humankind relationally. Just as the three Persons of the Trinity exist eternally in loving relationship, so we also are made to be in loving relationship with others: “the relationship itself is the image of God” (68). The chapter with which I struggled the most was chapter 9, “Mad about Miracles.” The authors argue that “the expectation of miracles stigmatizes and devalues individuals as insufficient; the lack of divine interception to restore them to acceptable normalcy suggests alienation by God as well” (98). Shortly thereafter, however, they concede, “Of course, there is nothing wrong with desiring a cure for our problems, whatever they may be” (98). I don’t want to be too critical of the positions they stake out in this chapter. Indeed, any Christian who struggles with a long-term disability, or any Christian parent of a child with a long-term disability, will ask these kinds of questions. I’ve asked them myself. The matter of divine action is an exceedingly difficult topic. I would ask, though, if seeking a cure through prayer is altogether different than seeking a cure through modern medicine. If praying for a person’s healing and expecting God to answer that prayer somehow stigmatizes that person,wouldn’t seeking medical healing have the same stigmatizing effect? In both cases, we are looking to cure the impairing condition. One might argue that when we pray for divine healing and it doesn’t happen, there are any number of additional implications: Is it the divine will that this person remain disabled? Is it because of a lack of faith? Is it because of some sin? These kinds of questions, however, have to be given serious consideration and addressed individually before we can say that some expectation of divine healing is necessarily harmful. At times I’ve puzzled over why the doctrine of the Trinity is most often left out of arguments for diversity. This doctrine is an extremely powerful resource that might be deployed in such arguments. Perhaps it is because affirming the Trinity necessarily involves a certain level of particularity about the nature and identity of God, and some might see this as undermining the concept of diversity. If that is the case, though, then the concept of diversity has supplanted the Christian God as the object of our worship and the centerpiece of our proclamation. The authors of this book have done us a great service by unpacking some of the ways in which the doctrine of the Trinity comes to bear on the diverse nature of humankind and upon our relationships with one another. Whether or not you have a particular interest in disability studies, I highly recommend this book. 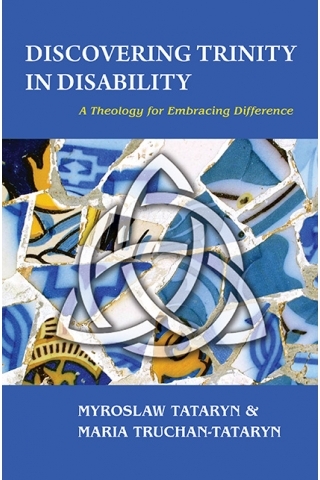 While it is a valuable resource for thinking theologically about people with disabilities, its implications reach into many other areas of the life of the church. October 10, 2014 in disabilities, disability. I had a fairly strong understanding of God the Father because of Old Testament stories; God the Son was muddled–I knew he had died on a cross and rose from the dead and that had something to do with our sins; God the Holy Spirit was something I believed when I said he Apostle’s Creed but it seemed to have more to do with “those” holy roller types. Like me, I think many in the UMC would be stunned to learn that it really is about all three! The Daily Text on seedbed.com is currently dealing with The Acts of the Apostles, which JD Walt renamed The Acts of the Holy Spirit. Through the Daily Text, I have been able to get comfortable with the thought of the Holy Spirit at work in my life and that He has always been at work in my life. To date, my best understanding of God the Son comes from the Heidelberg: He has always been in existence. In Jesus Christ, He is God choosing to become human, the Creator choosing to become the created and that is only the beginning of what He does: He is God himself paying the penalty He requires for our sin. He currently intercedes with God the Father on our behalf; He knows what it is like to live in our skin. He is currently working for our redemption through the Holy Spirit. He, the one who paid the penalty for our sin, will be our final judge. And I guess I see God the Father as the overseer. But all three have become an intertwined whole; each with their own essence but existing as a functioning whole. I finally learned this within the last couple of years on my own; I am 61 years old. I am the proof of what Kenneth Collins stated in one of his books: Redemption begins with knowledge. And consistent knowledge as to who God is and who we are in relation has been scarce in the UMC for a very long time. It is why people are talking past each other–they are talking apples and oranges because they are coming at it from different perspectives/understandings as to what Christianity is about and what the church’s role is in relation to society. A good place to see that is on Jeremy Smith’s blog, Hacking Christianity; read the section titled Geek Gospel.